First of all, if the painting wud be undesigned as M.F Hussain, u cud probably sell it for crores and nobody would question its authenticity, coz i definetely felt somewhere it reflected M.F Hussain style of work.I mean it. 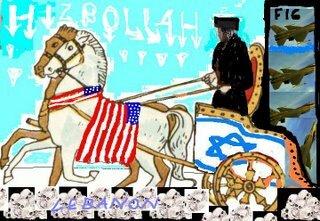 As of the concept of depiction I guess the Chariot is US and the horses Israel, and if i would do this painting, i would replace the horses with donkeys. 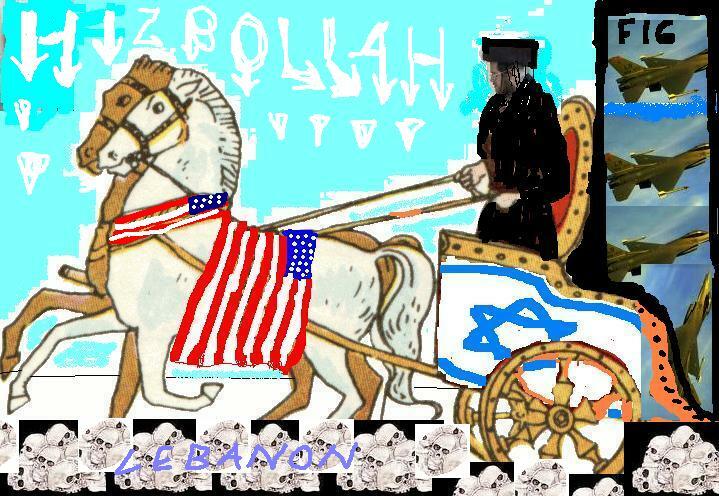 The skulls are lebanese, and Hezbollah is lebanese too.They are a part of democratic rule elected by people, we cannot isolate them from the labanese.HAMAS was also elected by people of their own country, we are in no position to term them as Militants or Guerilla organisation or isolate them. Both these parties have been harshly termed as Militants.